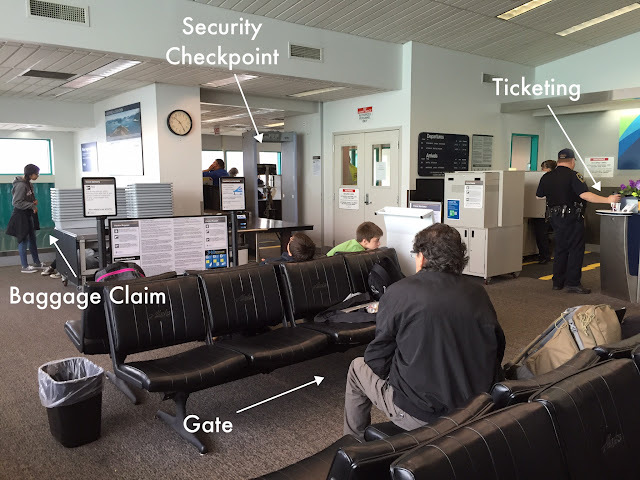 On Friday morning, we returned to Wrangell's one-room airport, marveling at the architect's ability to fit ticketing, gate, baggage claim, and security screening into a single room. Oddly, the diminutive security station was staffed by five TSA agents. Our tax dollars at play work. With nowhere to go past the screening area but out to the tarmac, passengers were not allowed to undergo screening until the aircraft arrived from Ketchikan. Having no separate TSA Pre✓ checkpoint, these smaller airports provide us with a laminated blue card that is our license to keep shoes, belts, light jacket and headwear on, although liquids and laptops must be scanned separately. After stopping in Petersburg (80 miles away) just long enough to drop off and pick up passengers, we continued to Juneau (another 124 miles), arriving just before 1 p.m. We picked up a dark blue almost new Ford Explorer from the Hertz airport desk. Though it was a major improvement over the Wrangell beater, the daily rate was about the same. 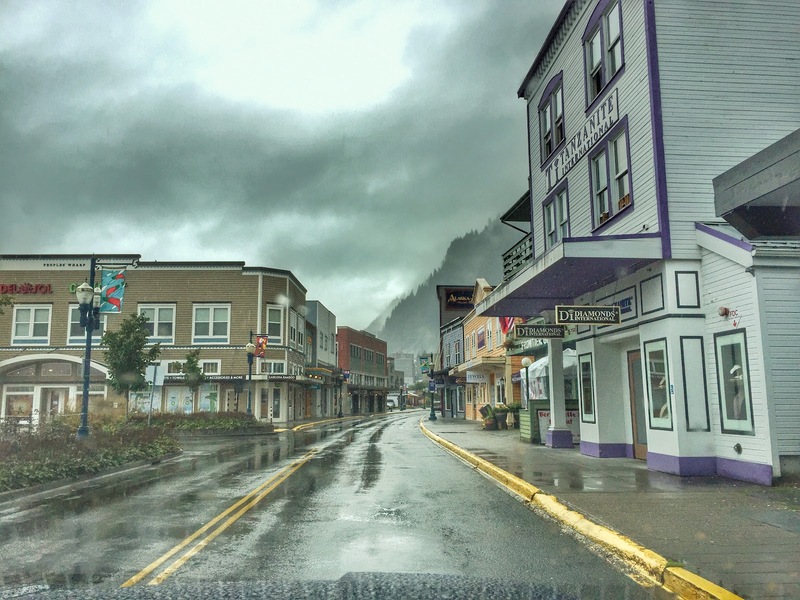 America's only state capital inaccessible by road, Juneau (pop. 32,660) is located on Alaska's Inside Passage. Though it is on the mainland rather than an island, Juneau is surrounded by rugged terrain, effectively preventing the construction of a road network leading to it. 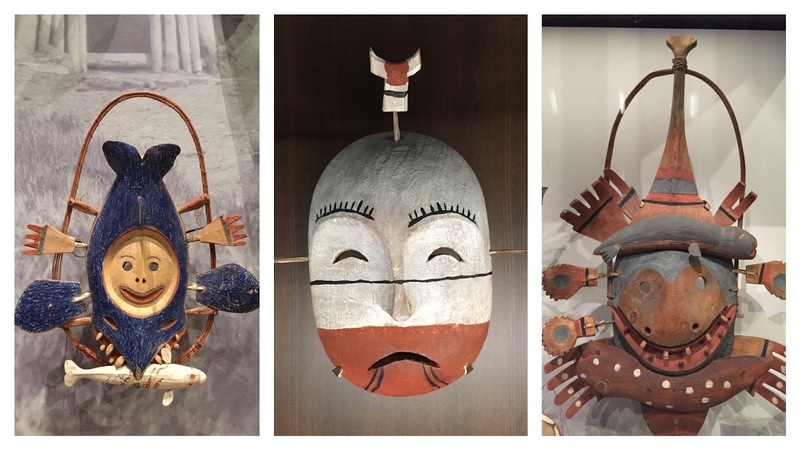 To reach their capital city, Alaskans must fly or take a ferry. Periodic efforts to move the capital closer to the center of population near Anchorage have failed. Since statehood, the legislature has officially rejected the proposal 13 times, the voters, eight times. Though Juneau is one of the smaller capitals by population, its land area, covering more than 2,700 square miles, makes it the most expansive state capital and one of the largest municipalities in the U.S. It's slightly bigger than the entire state of Rhode Island. Since we love visiting state capitol buildings, we were disappointed to learn that Alaska's is in the middle of a massive renovation project and completely closed. Juneau's airport is about 14 miles from the city in a town called Mendenhall, where our hotel was as well. 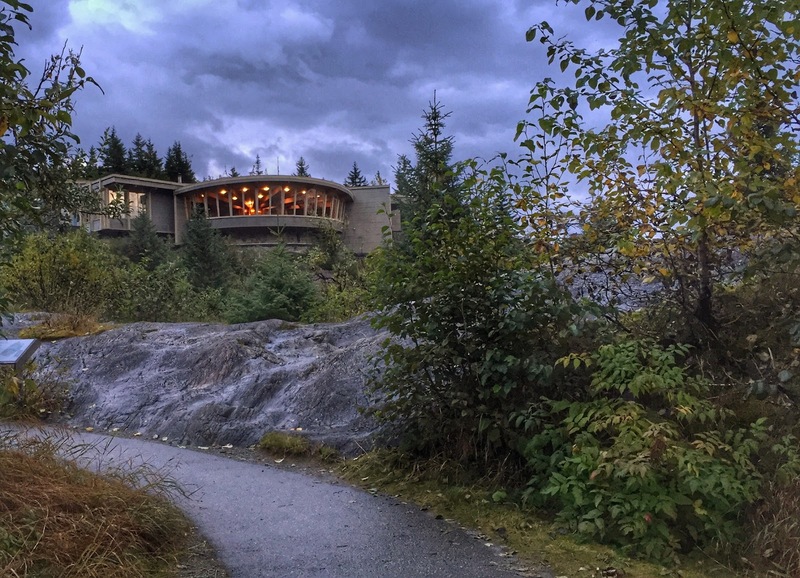 After checking in there, we set out to find lunch in Juneau proper. Yelp helped us find Rockwell on S. Franklin Street. 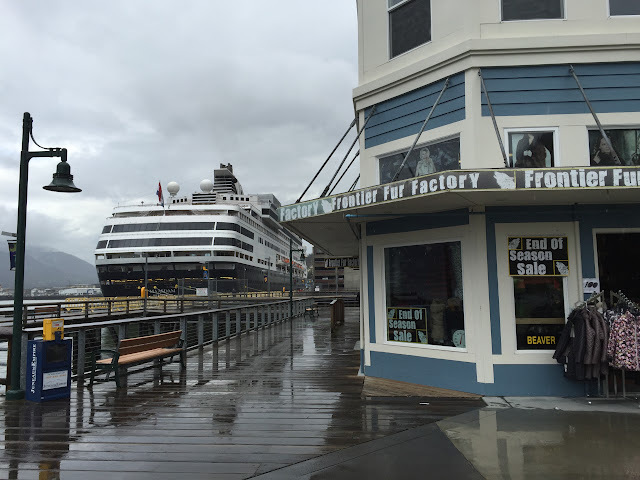 On our way there, we noticed that two Holland America cruise ships were in port, and even in light rain, passengers were strolling the city streets and, from the bags they were carrying, fruitfully shopping. Rockwell's playlist included "Sweet Home Alabama"
Located in the old Elk's Lodge, which had earlier housed Alaska's first territorial legislature, Rockwell has an industrial vibe, a warm and welcoming staff, and classic rock music playing. After our less than nutritious meals in Wrangell, Rockwell's menu offerings were a very welcome change. A beet and blue cheese salad with halibut for Ken and a magical grilled cheese with tomato, artichoke, mushrooms and pesto for me made us both feel healthier. Leaving clean plates behind, we walked down Franklin to the base of the Mount Roberts tramway and found a letterbox hidden there. Clue Tracker, our go-to letterboxing app, promised two other boxes at the top, but we were loath to spend $33 each to visit the summit on a cloudy, foggy day. Walking back to the car as light rain fell, we stopped at the Alaskan Crepe Escape food stand for a bit of dessert. We came up empty handed on our foray to Evergreen Cemetery in search of a letterbox but had better luck with a box at one of the cruise docks which was not in use today. 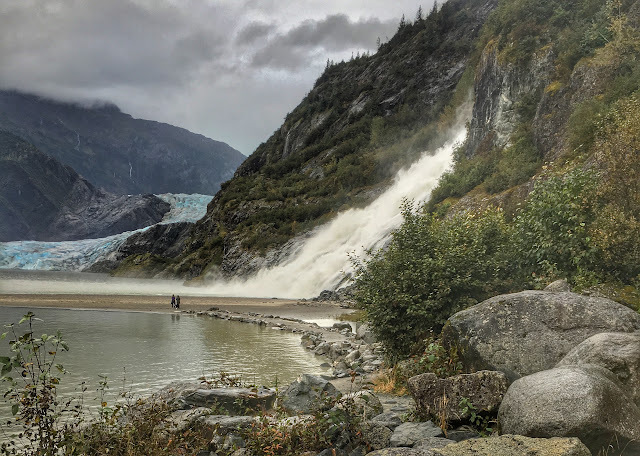 Returning to Mendenhall, we visited the Mendenhall Glacier, one of a handful of ice sheets promoted as "Alaska's most accessible glacier." Located in the massive Tongass National Forest, the glacier is home to the first Forest Service visitor center in the nation, opened in 1962. 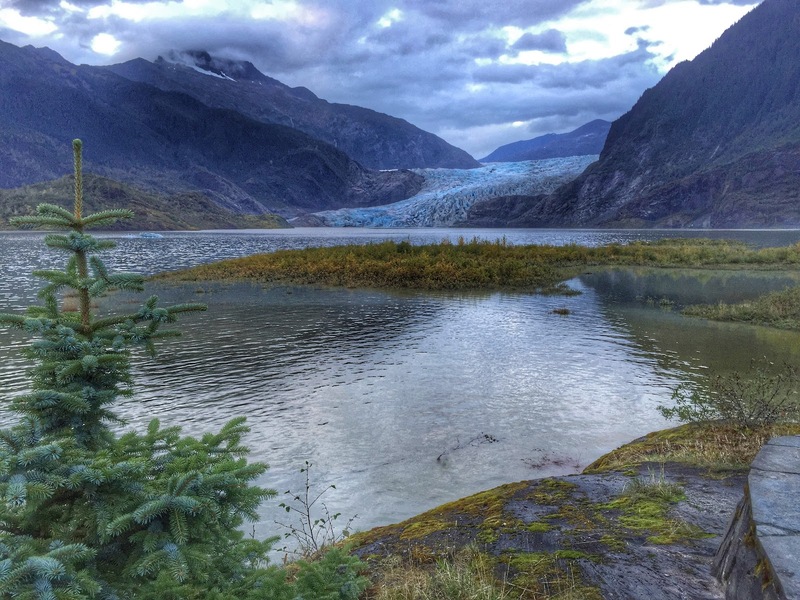 One of 38 glaciers flowing from the 1,500 square mile Juneau Icefield, the Mendenhall ends at the shore of the aptly named Mendenhall Lake. As snowfall adds to the glacial ice each year, gravity pulls the ice down valleys on its 13-mile path to the lake. At the end of its route, the glacier feeds fresh water into the lake. 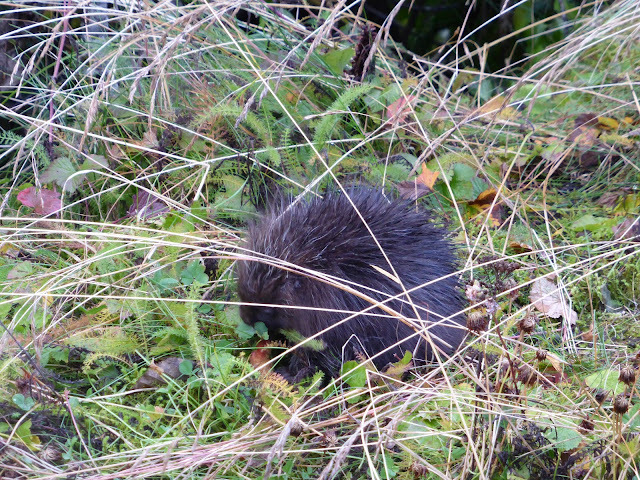 Wildlife watching was quite productive near the visitor center as we saw a juvenile bald eagle in a tall spruce and an adorable baby porcupine in a fenced-off area near the parking lot. Though the ranger reported that a mother black bear and three cubs had been seen from the Steep Creek Trail earlier in the day, they were gone by the time we arrived. Taking advantage of some of the short trails around the visitor center, we enjoyed a bit of hiking but darkness was approaching, preventing us from searching for a letterbox on a longer trail. At a nearby Fred Meyer supermarket, we found ample supplies for a healthy evening meal in our well-stocked suite. Fatigue set in after dinner, and we were soon in bed. Saturday dawned damp and cloudy. Another day in southeast Alaska, another day of rain. When we left the hotel just after 9:30, liquid sunshine, as locals refer to it, was streaming down at a steady pace. As they have since we arrived, temperatures hovered in the mid 50s. Holding out hope for seeing the bears we heard about yesterday, our first stop was the Mendenhall Glacier visitor center. 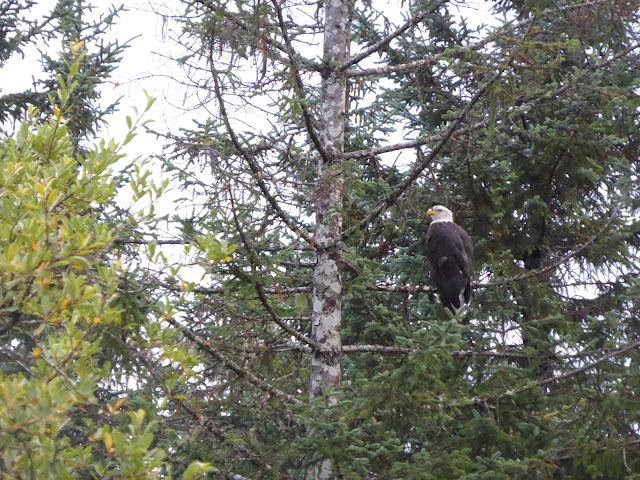 The young eagle we had observed on Friday was still there, this time in another tree, but no bears were in sight on the trail. Driving toward Juneau, we spied numerous bald eagles sitting on top of various light poles, feathers fluffed to insulate their bodies from the rain. Soon after, we saw a couple dozen more fishing from mudflats uncovered by the very low tide on Gastineau Channel. By the time we were able to turn around and go back for a closer look, they had flown. Streets were deserted mid-day Saturday with no cruise ships in port. So we went on into Juneau, finding it much quieter today with no cruise ships in town. 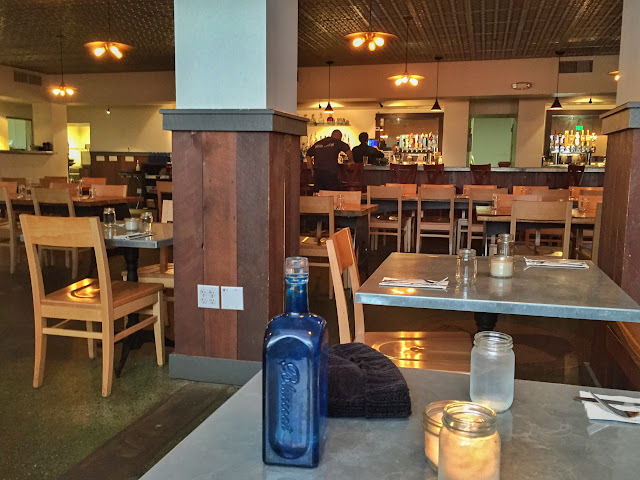 We couldn't resist returning to Rockwell for lunch, and they did not disappoint. After lunch, we checked out the newly opened Alaska State Museum. 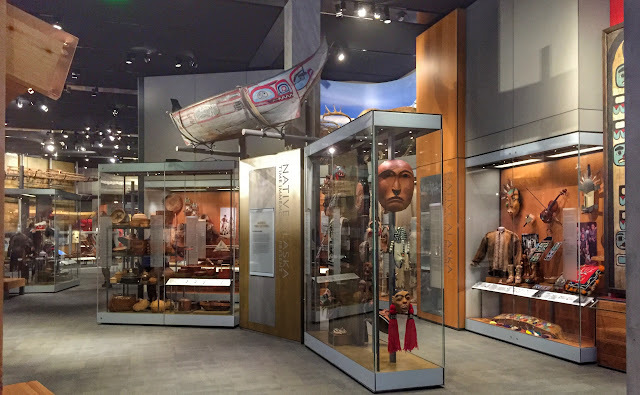 Wide ranging exhibits tell the Alaska story, both Native and non-Native. 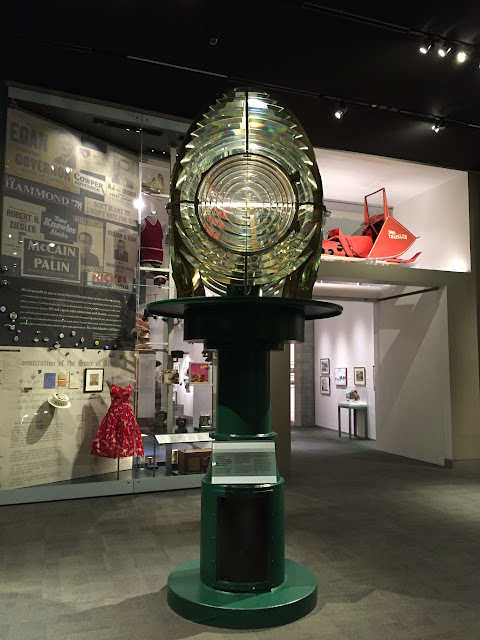 Large artifacts add to the museum's effectiveness. After 12 years of work and $140 million in spending, the building celebrated its grand opening in June of this year. Meant to serve Alaska for 100 years, the state archives, library and museum (known affectionately as SLAM) sprawls over 118,000 square feet in three stories. 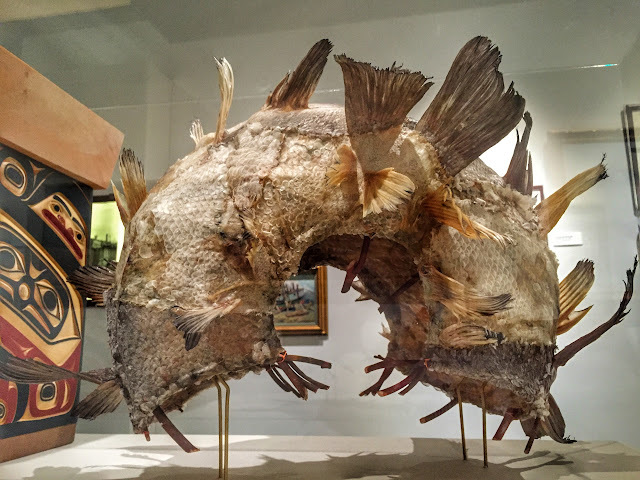 That's seven times the size of its predecessor, so the imposing edifice affords plenty of room for its collections to grow. Alaska's SLAM was the last significant project funded with revenues from the state's 2008 oil boom. 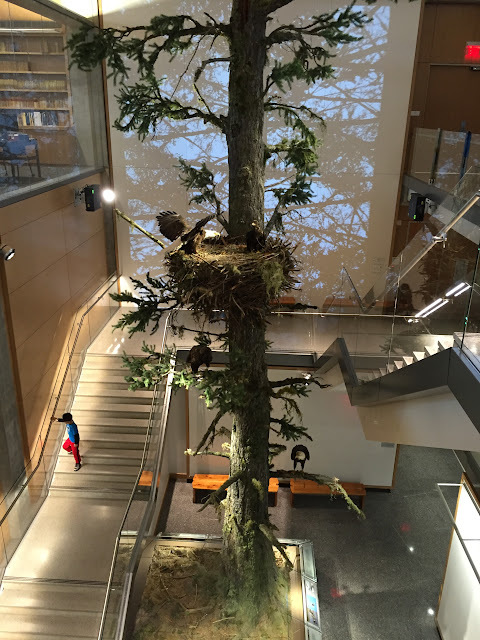 Eagle tree reaches from the floor to the ceiling of the third floor. 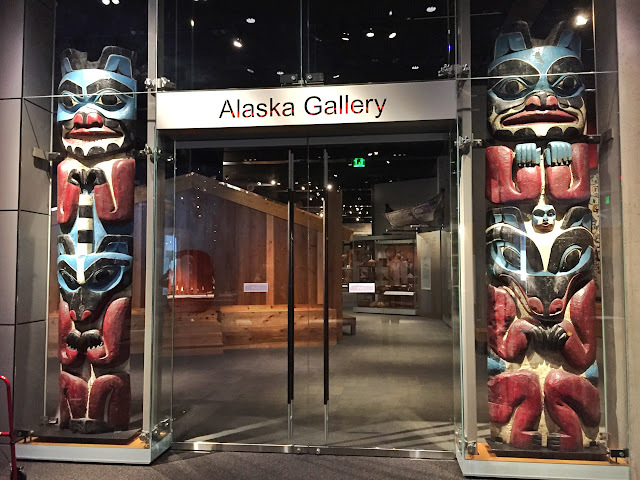 Our visit on a Saturday afternoon was limited to the museum, whose exhibits and artifacts detail the history of Alaska from ancient times to the present. Entering the building, visitors are dwarfed by a life-size replica of an eagle nesting tree. Flights of stairs wind up and around the tree taking visitors alongside a typical nest for a close-up view. 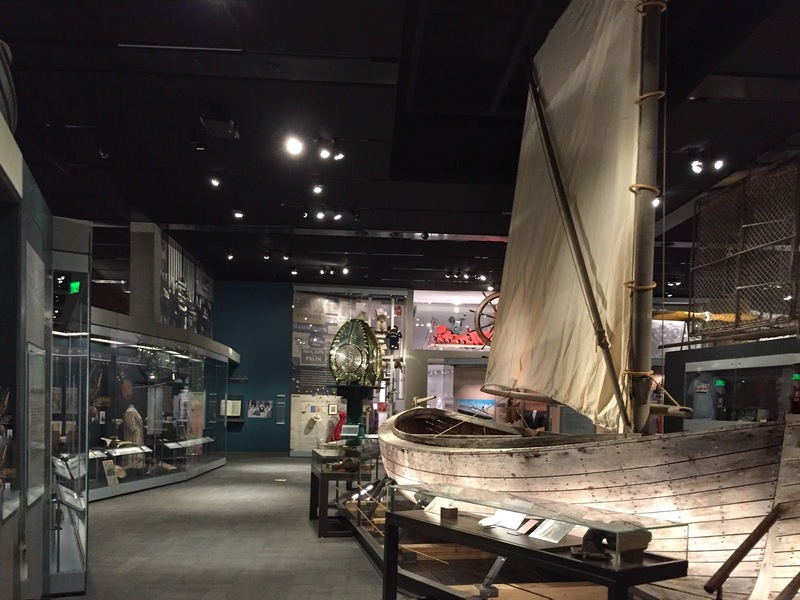 With the state's reputation as America's "last frontier," the exhibit on 21st century Alaska—"Past Frontier? "—was particularly thought-provoking. Though our stereotype of Alaskans, perpetrated by reality TV programs set in the state, still has most citizens living the pioneer lifestyle isolated in the bush, most Alaskans today don't live off the land or even close to it. They are urban. 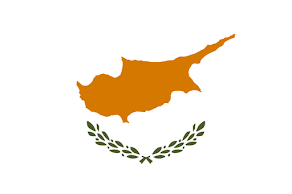 The 20th century transformed the state's economy. Its strategic location at Asia's back door compelled the construction of military facilities and spending during both World World War II and the Cold War. Then the bonanza from oil in the North Slope injected more wealth into the state. 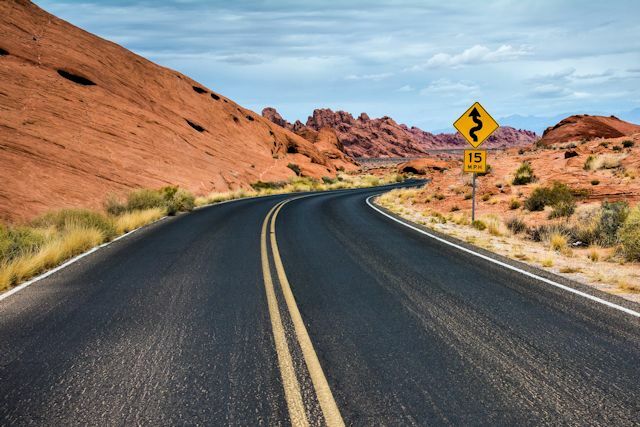 Beginning in the 1980s, military employment and brawny manual labor occupations yielded to a new economic reality based on tourism and other service sector occupations. Today exportation of raw natural resources is still critical. In fact, the oil and gas industry supplies almost 85% of the state's tax revenues. But tourism—the state's second largest source of employment—plays an increasingly important role. 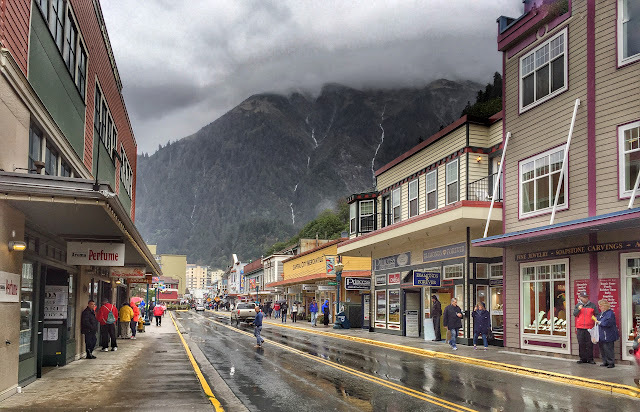 As we have seen with cruise ship ports along the Inside Passage, some of Alaska's towns have successfully re-packaged their main streets with a Disney version of themselves that seems to appeal strongly to tourists. From the museum, we took the bridge across Gastineau Channel to the residential community of Douglas, hoping to find a high spot for an overview of Juneau, but none was to be found. A return to the Mendenhall Glacier trails still turned up no bears, but a hike out the Nugget Falls trail offered excellent views. With lots of planning to do for the next few days, we picked up dinner supplies, fueled up the car and returned to our cozy hotel. Tomorrow we'll take an early flight to Anchorage to begin a seven-day road trip. 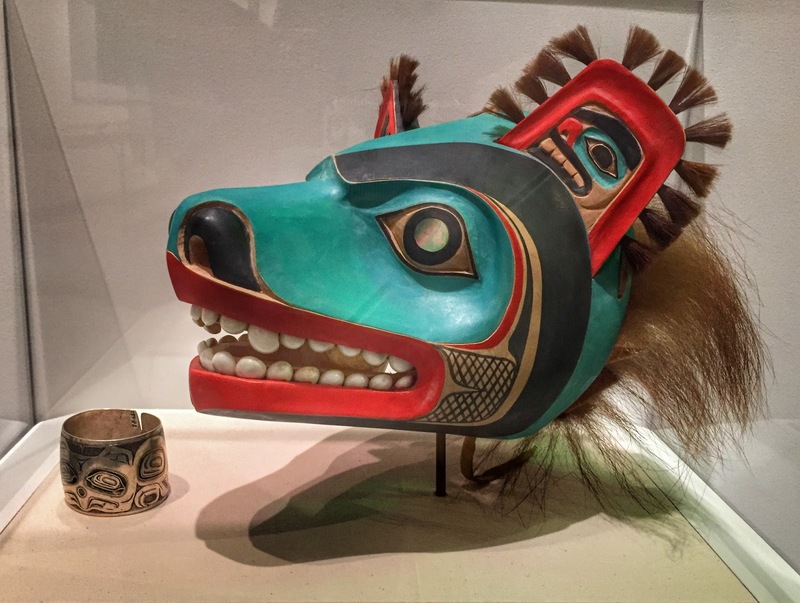 In the State Museum, a mask made by Nathan Jackson, who carved the statue in Wrangell's Eagle Park. 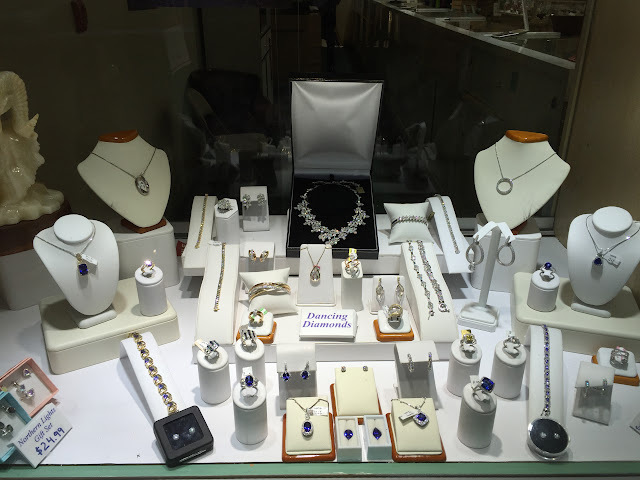 Many shops are conveniently located near the cruise ship berths.